Caption reads: Left: Scene in the '60s a the Delaware Ave and Shackamaxon St. plant of the Pennsylvania Sugar Company when three- and four-masters loaded with molasses from the tropics helped to establish Philadelphia as one of the great sugar refining centers of the world. ... Right: Air view of the company's present refinery on the same site, showing the alcohol plant, top of picture, and Tank Farm No. 1 for the storage of alcohol adjacent to the refinery building (left). 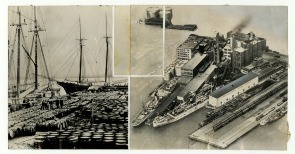 The photograph, taken before the war, shows two modern cargo ships discharging raw sugar at the refinery wharves.